edpl calculates the EDPL uncertainty values for a collection of pqueries. --first-only Only print the first name for each pquery. 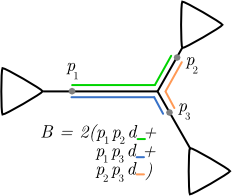 The expected distance between placement locations (EDPL) is a means of understanding the uncertainty of a placement using pplacer. The motivation for using such a metric comes from when there are a number of closely-related sequences present in the reference alignment. In this case, there may be considerable uncertainty about which edge is best as measured by posterior probability or likelihood weight ratio. However, the actual uncertainty as to the best region of the tree for that query sequence may be quite small. For instance, we may have a number of very similar subspecies of a given species in the alignment, and although it may not be possible to be sure to match a given query to a subspecies, one might be quite sure that it is one of them.